When it comes to wedding cake style, rustic has been the most requested of all. As for the flavor, chocolate mud cake rules. Here's the well-loved chocolate mud cake made for the wedding a couple days ago. I normally use chocolate buttercream as frosting. I switched to dark chocolate ganache this time. The cake was sweet and rich on its own so I figured I could make ganache using dark chocolate with 70 percent cocoa to make it less cloying. The combo turned out perfectly balanced. 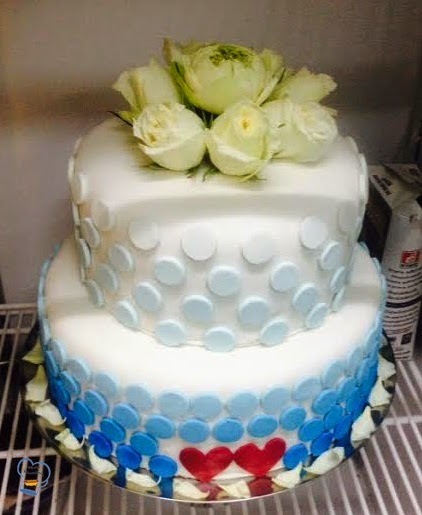 As for the decoration, the bride requested the cake to have circles that go from dark blue to light blue. The tinting process was a lengthy procedure. It took me an hour and a half to color each 100 grams of white fondant with blue. I managed to come up with seven shades. I stick them on the cake with buttercream. I also made heart cut outs which I stick on the front of the cake. The flower enhancement was beautiful but I would say its color didn't really match the blue theme of the wedding.